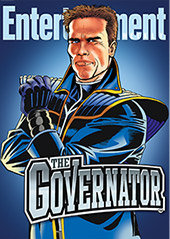 The series is set to debut in 2012; GET YOUR TIVOS READY. 1. The Koch brothers, the billionaire oil executives who have financed the Tea Party movement, are now funding a climate change study at UC Berkeley that is led by a global warming skeptic, the LA Times reports. Some scientists fear that the Berkeley study is designed to undercut climate-change science and the Obama administration’s plans to regulate greenhouse gas emissions. The study is being headed up by Richard Muller, a Cal physicist who is a longtime critic of the international scientific consensus on climate change. And the largest backer of the study is the Charles G. Koch Charitable Foundation, which donated $150,000 to it. Charles and David Koch are the nation’s most prominent financiers of efforts to block the regulation of greenhouse gases. 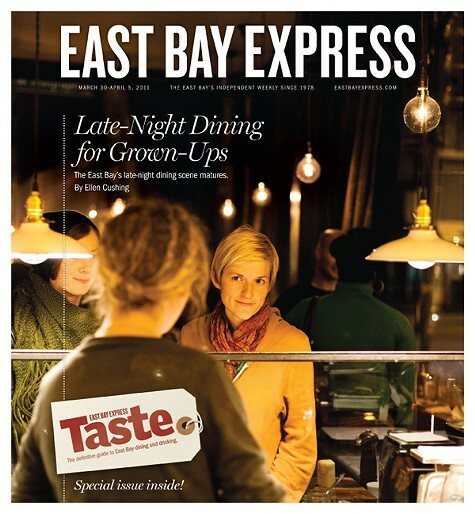 This week, we give you three feature stories for the price* of one: see, it's our semi-annual "Taste" special issue, in which we dutifully plumb the depths of the East Bay's ever-expanding food and nightlife scene in order to introduce you to such deliciousness as the new intensely bitter, super-hoppy Double IPA beers; frozen custard, Italian-style hero sandwiches, strombolis, and other East Coast comfort foods, now making their way to the Bay Area; and Plum's burger: "juicy and sharded with bits of beef cheek and oxtail, slathered in house-made horseradish, and served on a slate-black plate with fresh, locally-grown greens." If your mouth isn't watering, you're not paying attention. Check it all out here. 1. Jerry Brown and Democratic lawmakers called off plans for a June election that would have asked voters to approve the governor’s proposed tax-extension measures after Brown declared yesterday that budget talks with Republicans were dead, the Chron, CoCo Times, and SacBee report. Brown and organized labor are now looking at launching an initiative drive for a November election. But such a move likely would require the state to issue IOUs this fall to stay afloat financially. 2. The move also means that redevelopment agencies throughout the state are safe — at least for now. Brown needed Republican votes to kill redevelopment and for his tax measures proposal. Brown blamed the Republicans’ last-minute laundry list of demands, including tax breaks for corporations, for his decision to end the budget talks. The GOP leadership had issued a seven-page list of demands last Friday. Republicans, meanwhile, blamed labor unions and other Democratic constituencies for allegedly failing to compromise on their proposals to slash public-employee pensions and enact a state spending cap. The Alameda City Council has selected longtime Oakland City Attorney John Russo to be its new city manager, Michele Ellson of the Island reports, citing an anonymous source. The council may make an official announcement tonight at its meeting. Russo, who has been Oakland's city attorney for more than a decade, and before that, was a councilmember, is friends with Alameda Mayor Marie Gilmore and Alameda Councilwoman Lena Tam. He also donated heavily to their campaigns last year, and to that of Alameda Vice Mayor Rob Bonta. Russo also has been unhappy for some time in Oakland and has clashed repeatedly with members of the city council and with Mayor Jean Quan. The Oakland City Council will have sixty days to name Russo's replacement, who would then serve out the rest of his term, which runs through 2012. If the council fails to do so, then there will be a special election. 1. The Barry Bonds federal perjury trial turned tawdry yesterday during testimony by his former mistress, Kimberly Bell. California Watch reports that Bell told jurors that after Bonds blamed a 1999 elbow injury on his steroid use he grew increasingly angry and controlling. He also became far more muscular, and "developed acne on his upper shoulders and back," she said. "His hair was falling out quickly, and he ended up shaving it all off." Bell also told jurors that Bonds underwent "changes sexually and in his testicles." And Bell said that "more than once," he threatened to "cut my head off and leave me in a ditch," she said. Baseball’s homerun king, she said, also threatened to "cut out my breast implants because he paid for them. ... He was very controlling." 1. The FBI is investigating Elihu Harris, the ex-chancellor of the Peralta Community College District, for his role in steering a $950,000 no-bid contract to his friend and business partner, Mark Lindquist, the Chron reports. Federal agents also questioned Peralta Vice Chancellor Sadiq Ikharo, who administered the contract. Last year, the Peralta board decided to not renew Harris’ contract as chancellor after the CoCo Times published a series of investigative stories about the Harris-Lindquist connection and lavish trips Harris took on Peralta’s dime. The Oakland Police Department is asking for the community to help nab a felony grand theft suspect who has been running a scam against the elderly.